Sometimes we suffer more than the person with Alzheimer’s. That’s because, in part, people with Alzheimer’s disease typically live mostly in the present. They don’t live that way because of any particular wisdom, though. It’s because of the disease. They usually don’t fret over yesterday simply because they can’t remember it. That’s one of the less dreadful things about this disease. People with dementia typically quickly forget unpleasant things that happen to them and upset them terribly. And they forget it quickly – sometimes by the next day if not in a matter of hours or minutes. Yet caregivers who experience a patient’s extreme distress over some issue or another tend to keep the patient’s suffering clearly in their minds, and they themselves can suffer greatly because of it. 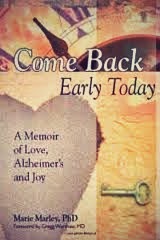 Caregivers don’t easily and quickly forget painful things that happen to their loved one. They suffer because they think their loved one is still distressed, and they feel even more pain because there’s usually nothing they can do about it. 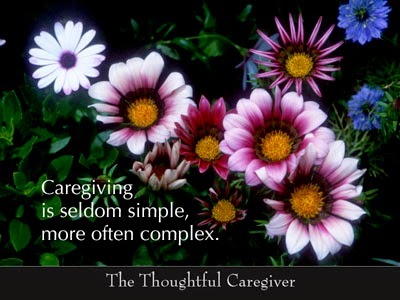 Caregivers can be deeply troubled about the patient’s reaction to hurtful things for days, weeks or even years later. Unless they observe their loved one very carefully they may not realize he or she has forgotten all about the incident and moved on to other things. If not, that’s what’s important. We shouldn’t let it bother us either. We need to think about and accept their feelings more than we focus on our own. Here are some examples that illustrate my point. I have a friend who told me that one Christmas day she brought her mother, who was living in a nursing home, to her own home for the day, thinking this would be a special treat for her mother. Once at the house her mother became deeply distraught and kept asking to go home. As my friend was telling me about this event it was clear that she was still upset about it. And the shocking thing was that this event that had occurred three years earlier. I’d be willing to bet that her mother forgot all about it the next day if not the moment she arrived home. In other words the incident no longer mattered to her. In addition to forgetting bad things that happen to them, people with dementia might adjust to change more easily than their loved ones do. That’s because they may forget that any change has occurred. They don’t remember how things were before the change. Thus they’re not aware any change has taken place. Another incident involving wanting to go home occurred when Ed was moved to another room in the nursing home where he was living. Like my friend’s mother he, too, wanted to go “home” – back to his old room. He made this mournful request to every single person who passed by. And he repeated it to me several times. In fact, it’s the only thing he said to me that day. I was distressed because Ed was suffering. My heart was broken as I drove home. Much to my surprise, however, when I arrived to visit the next day he had forgotten all about it. He was delighted to see me – as always – and he didn’t once ask to go home. He was functioning as though he hadn’t been moved at all. Nonetheless that urgent plea reverberated in my mind and caused me great emotional pain for days afterward. Again, I was the one who was suffering – not he. He was living only in the present and he obviously felt as he would have had he not been moved. Another example is that my cousin was angry with her mother’s facility because they sometimes dressed her in sweats during the daytime. Her mother would never have previously done that. But as it turned out once she was in a nursing home it didn’t bother her at all. To put it simply something the person may not have liked before getting Alzheimer’s may be quite okay with them after developing the disease. We need to let it be okay with us, too. Marie Marley, Is Alzheimer’s Ever Not Dreadful? Marie Answers, Can Gifts Bring Joy to a Person Living With Dementia? Alzheimer’s Journal: Ed’s Creative Attempt to Get Vodka in His Nursing Home!